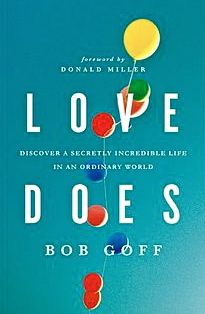 Love Does is a 2012 Christian non-fiction book by Bob Goff. The book was released on May 1, 2012 through Thomas Nelson and collects several essays about life stories and experiences. The book contains several anecdotes that he then ties into Christianity and how it relates to Goff and others. In each passage Goff relates several life lessons and how he believes that they can help the reader. RELEVANT gave the book a positive review, writing that it "is an easy, challenging and inspiring read. If you've been looking for a breath of fresh air in your spirituality, this is it." ^ "Leaking Jesus: Bob Goff's "Love Does"". Homecoming magazine. Retrieved 28 May 2013. ^ "Review: 'Love Does' by Bob Goff". RELEVANT magazine. Retrieved 28 May 2013. This page was last edited on 20 October 2018, at 09:53 (UTC).